An image of collaboration: This image of a boat wreck in Louisiana’s nearshore waters was the result of collaboration with all project partners. During the 2005 hurricane season, Hurricanes Katrina and Rita inflicted severe damage on the Gulf of Mexico coastal region and deposited huge amounts of debris over large areas of the Gulf nearshore waters. This submerged marine debris posed a persistent hazard to commercial navigation, fishing activities, recreational boating, and living marine resources. In an effort to address marine debris impacts on the Gulf Coast, Congress tasked NOAA in July 2006 to survey and map nearshore waters impacted by Hurricanes Katrina and Rita to facilitate debris removal. The NOAA Marine Debris Program led the coordination of this effort. A collaborative effort between NOAA's Office of Response and Restoration and Office of Coast Survey, the team worked with federal, state, and local stakeholders to support the recovery efforts in the Gulf of Mexico. 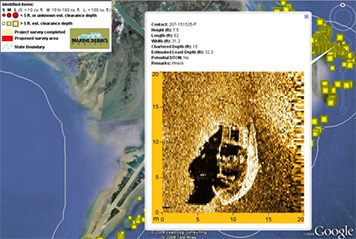 Phase I of this project began in 2006 and employed side-scan sonar to image the sea floor and locate marine debris in Alabama, Mississippi, and eastern Louisiana. Maps of the sonar targets detected along with other information were posted on the project website. Partners of the project successfully kept the public up-to-speed on the project's overall progress as well as results through the projects website and outreach across the region in the form of videos, printed materials, and public service announcements. In 2008 and 2009, Phase II of the project focused exclusively on Louisiana. At the conclusion of the project, over 1,580 square nautical miles were surveyed and 7,150 targets were located and mapped.